"In modern war… you will die like a dog for no good reason." This Ernest Hemingway quote is displayed at the beginning of This War Of Mine: Stories ($1.99), as it is in the original This War Of Mine. The reminder is necessary, as the experience you’re about to enter shows you can have the best intentions in the world, but sometimes even the innocent, the civilians die during war. The first episode of Stories puts the spotlight on Adam and his daughter Amelia. War begins as a backdrop to a familial drama, but soon enough the war and family issues become one. You cannot trust anyone. Not even your estranged brother. And the goal is clear: get your daughter out alive. For those not familiar with the title, This War Of Mine brings players behind enemy lines to see how living in a war-torn city affects normal citizens. There are several scenarios to play through, each with different characters and different plot lines, but many overlapping the others. It’s up to the player to keep everyone in their home fed, healthy, rested, happy, and, quite frankly, alive. To progress, items and workstations can be crafted, offering new items to craft. At night, the choice is between scavenging outside locations and staying home to protect yourself and your goods. The goal is simple: last until the war ends. But that’s at a different point in each scenario, and some are remarkably difficult. 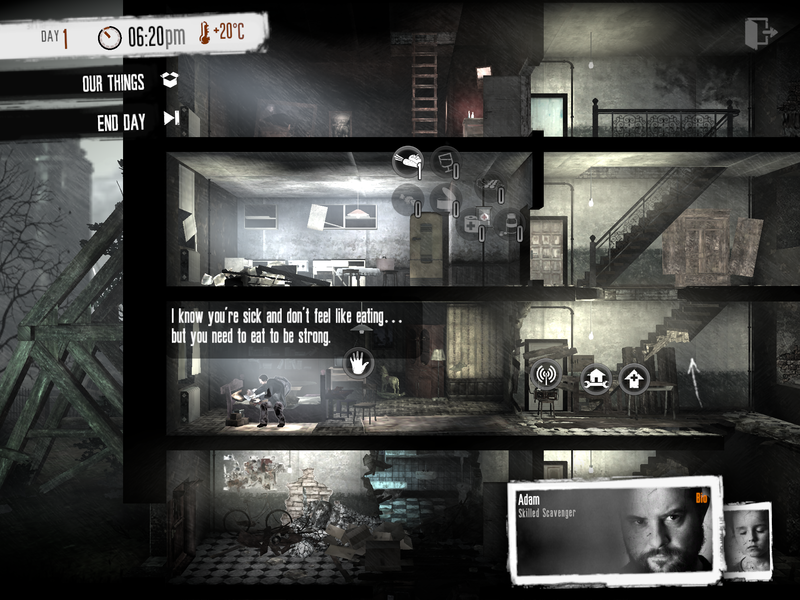 The narrative of This War Of Mine: Stories – Father’s Promise seems speedy compared to that in This War Of Mine, where you need to slowly piece together the connections between people by progressing through different scenarios. In Stories, the focus is on the single family unit, comprised of Adam and his daughter, Amelia. Adam’s wife died, and Amelia is so grief-stricken she won’t even speak. The story is already so devastating, I knew it would only get worse. Having one person to do all the work is emotionally exhausting. And as the days progress, the sounds of home are often drowned out by those of blasts and gunshots. It’s a constant reminder that Adam and Amelia are in danger, every second of every day. There are long stretches of waiting during gameplay, for example while Adam sleeps. These moments are ideal for quietly contemplating the situation and strategizing for the night ahead. The familiar pencil-sketch graphics that continue to mesmerize me despite already having dozens of hours under my belt in This War Of Mine. Admiring the details is practically a mindfulness exercise for me at this point, and it helps clear my mind. 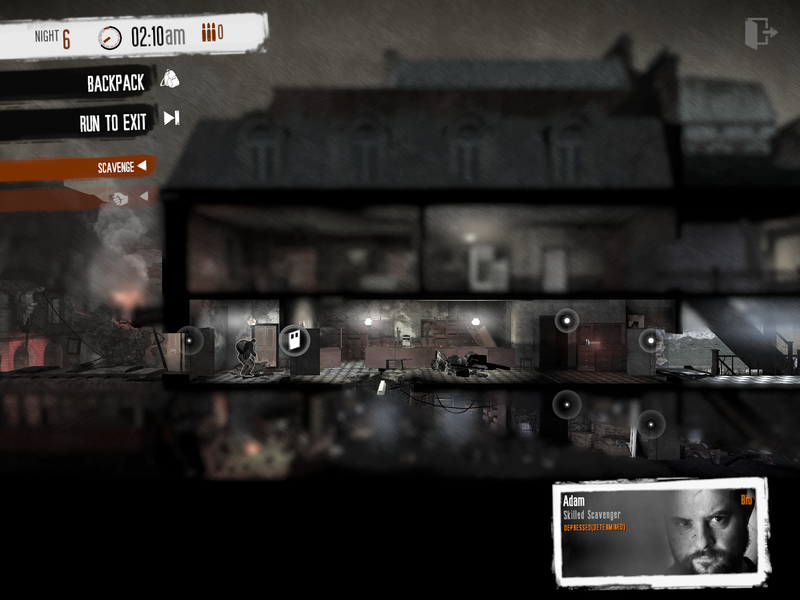 The controls are a breeze, and the same as in the mobile version of This War Of Mine: click to walk to that location, or double-click to run there. The visuals and controls are the only familiarities, with certain locations popping up for Adam to explore. I spent time in the school that’s been overtaken by the local homeless population, and a recently-blasted hospital that is somehow still operational. This War Of Mine: Stories functions well as a standalone title, with no need for it to be packaged with the original title. I can see the appeal of having it all in one place, but mostly I enjoy the clean interface and user experience presented in Stories. There is an added bonus too, as 11 bit studios has added Game Center achievements to the title; there are only four, and each appears to be evenly spaced apart. Depending on how quickly they progress through the days (you can skip to night if you so chose), players can expect to spend at least several hours with this first episode. When I reflect back on what I’ve written so far, it would seem as though This War Of Mine: Stories – Father’s Promise wasn’t good. I speak of slow progression, long moments of nothing, things getting worse, and feeling anxious; these could all be considered negatives in other titles, but for Stories it equates to something gut-wrenching, suspenseful, and deeply haunting. It is a welcome reminder that war isn’t all about the soldiers on the frontlines, that it has a heavy impact on citizens living in war zones. Father’s Promise, for lack of a better term, is a promising addition to the This War Of Mine line-up, and I’m already looking forward to more tears if/when the second episode (The Last Broadcast) comes to mobile platforms.